Meanwhile lets just say that we are proud Lisa Zimmermann contributed a whooping 28 entries. The research project MULTI-ReUse almost has reached its target line. Up to 20 participants discussed the state of the work during a project meeting at the beginning of March. What exactly is MULTI-ReUse researching? And why? The imagefilm (in German) summarizes the research project and outcomes in an easily understandable manner. How can you transfer knowledge from a research project to different target groups in an easy way? In MULTI-ReUse, the team relies on the touchtable! The EU has released a proposal about the reuse of local and treated waste water to ensure minimum requirements and their surveillance on an EU level. The MULTI-ReUse project was introduced at the Leading Trade Fair for Environmental Technologies IFAT 2018 in May in Munich, Germany. It was located at the booth of the Federal Ministry of Education and Research (BMBF) together with other funded projects. This report that deals with the requirements and criteria in different sectors and possible target markets for the MULTI-ReUse procedures is now available for download. On 17.-18.04.2018 the status workshop from WavE takes place in Frankfurt, Germany. 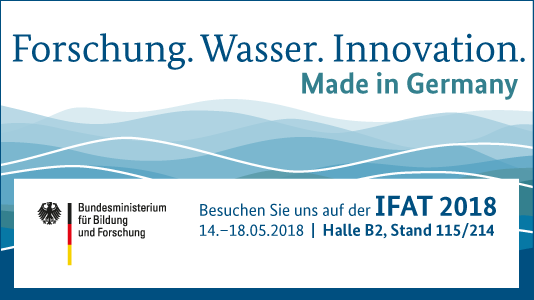 The funding measure WavE is financed by the German Federal Ministry of Research and Education (BMBF) within the focal topic “Sustainable Water Management” as part of the framework programme “Research on Sustainable Development” and the research agenda on Green Economy. In July 2017 the MULTI-ReUse pilot plant started its work. For the period of the next two years the plant is located on the premises of the waste water treatment plant in Nordenham. The plant treats already treated waste water furthermore.